I hope you're doing OK Gail! Great picture of the St. John's Wort in the sunlight. Good morning Gail, that is a lovely photo. I know your heart must be very heavy right now. I wish you the very best thru this sad time. Know that you have so many friends and even tho we are far away, we are thinking of you. Hope you are doing OK, dear Gail, and that the SF will be a nice distraction. 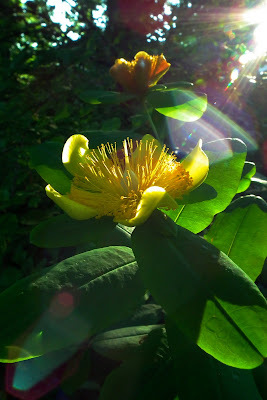 :) LOL, I've heard of St John's wort but realize now I've never seen it. So it kind of looks like a lily pad sitting on top of milkweed, lol. Great to hear from you, Gail! Hope you're doing well. Beautiful photo - always light at the end of a tunnel! Dear Gail, I'm glad the sun is shining for you, and I hope your spirits have lifted. Glad to have you back...George's tune is the perfect way to perk you up, too. Gail, glad you are back. Please take care. Thoughts and prayers are with you. PS When the weather cools down, I'll send those seeds your way. I'd rather not have them roast in the post. What a beautiful image ~ I hope the sunshine will be back in your life soon just as it is in this photo. Gail have been thinking of you....hope that you are coming to terms with the loss of your beloved sister. These times are not easy......positive thoughts and healing hugs coming your way. It's so difficult to lose a sister... sending you hugs and healing thoughts. I have been away so have just caught up with your blog. I am so sorry to hear about your sister. Please accept my sympathies - it must be a difficult time for you. Best wishes. I like your picture too- sun lifts the spirits! Little darlin'... just keeping with the theme. I'm sending you air hugs right now. Can you feel them? And every time I walk past my still-intensely fragrant and beautiful PPPPs I'm sending you another hug. Oh, what a great sun flare shot. I've never caught a flare, though I guess I haven't gone out to consciously try. I've been behind in reading and am sad to read from the other comments that you're grieving right now. Hugs from me to you, dear gardener. Gail, I am so sad to hear that you lost your sister. I too lost my oldest sister, prematurely when I was only 19. I am 57 now, and when I think of her these days, my thoughts are almost always happy ones: of her humor, intelligence, artistic abilities, lovely singing voice, and the wicked gleam in her big brown eyes when she was teasing her two younger sisters. We miss her to this day, but are comforted by a host of wonderful memories of times spent together. I hope you and your family will be able to get to that place in your hearts and minds soon. Such a gorgeous photo Gail. Warm, comforting thoughts and hugs to you and your family during this very sad time. Beautiful photo Gail. I'm so sorry for the loss of your sister, but so glad that you have lovely fond memories of her, that will always make you laugh, and smile. Glad you are back, even in sorrow, you are valued. May you continue to heal in spirit, mind & heart. I love the picture Gail. I'm sorry to hear about your loss also, it seems to have been a rough summer for so many people that I know. What a magically beautiful shot. I hope the sun is working its healing powers for you. Gail, I had no idea when we met that you'd had such a recent loss. My very deepest condolences. Sisters are precious.